Do You Know What Grandma Called "Organic?" Preheat oven; check to be sure that there are no rubber balls or plastic soldiers lurking on the shelves. Remove blocks and toy autos from the table. Grease pan. Crack nuts. 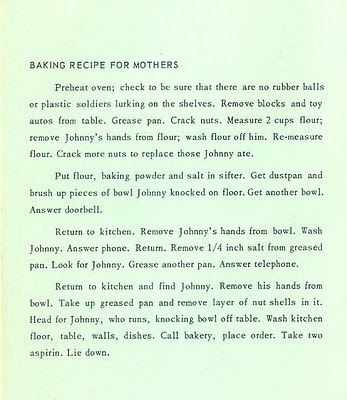 Measure 2 cups flour; remove Johnny's hands from the flour; wash flour off him. Re-measure flour. Crack more nuts to replace those Johnny ate. Put four, baking powder and salt in sifter. Get dustpan and brush up pieces of bowl Johnny knocked on floor. Get another bowl. Answer doorbell. Return to kitchen. 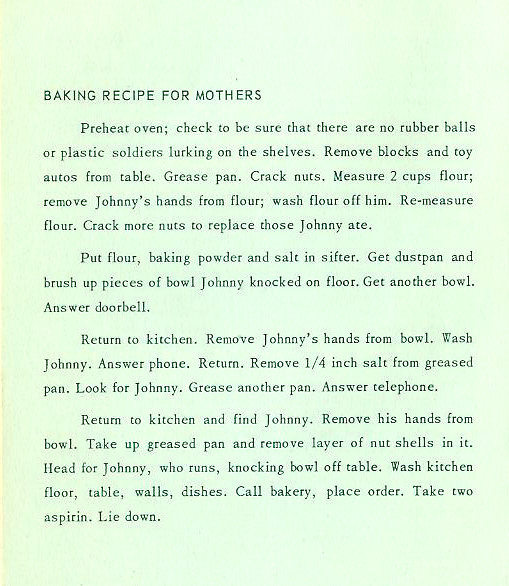 Remove Johnny's hands from bowl. Wash Johnny. Answer phone. Return. Remove 1/4 inch salt from greased pan. Look for Johnny. Grease another pan. Answer telephone. Return to kitchen and find Johnny. Remove his hands from bowl. Take up greased pan and remove layer of nut shells in it. Head for Johnny, who runs, knocking bowl off table. Wash kitchen floor, table, walls, dishes. Call bakery, place order. Take to aspirin. Lie down.